We're super excited for all of the food and family love, and are wishing you all a great time with your family! For this post, I'd love to share some thanks to those who have had an incredible impact on us the last year. Most importantly, I am forever thankful for being blessed with having Michael as a twin brother. According to the U.S. Center for Disease Control and Prevention, about 67-85% of fetuses in the United States and Europe are aborted after prenatal screening for Down Syndrome. In most of these cases, these are due to a lack of understanding regarding the DS community. If it weren't for Michael, I very well too could have had the same outlook. 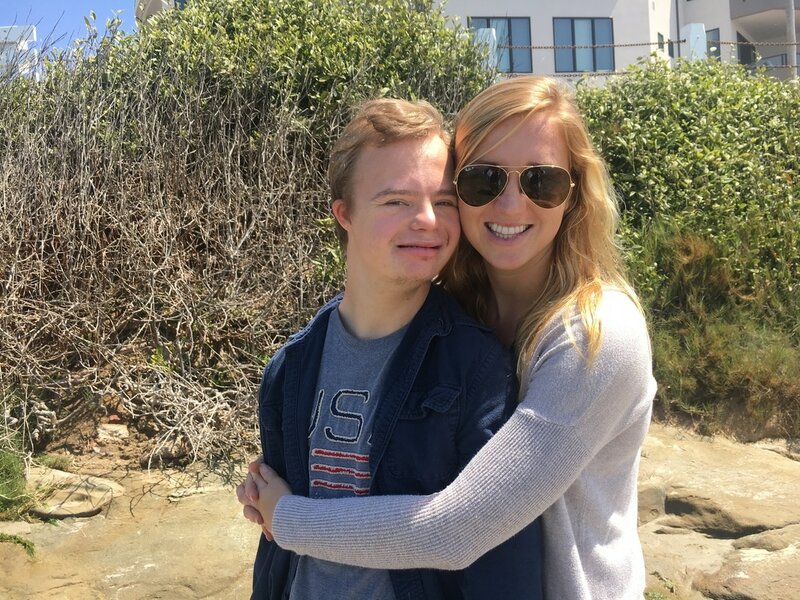 When I first attended UCSD, I would tell other students about having a twin brother with Down Syndrome, and some of them would still ask me what Down Syndrome is! For being at such a prestigious school, this really baffled me. It made me realize that there needs to be an increased sense of understanding surrounding the disabled community. 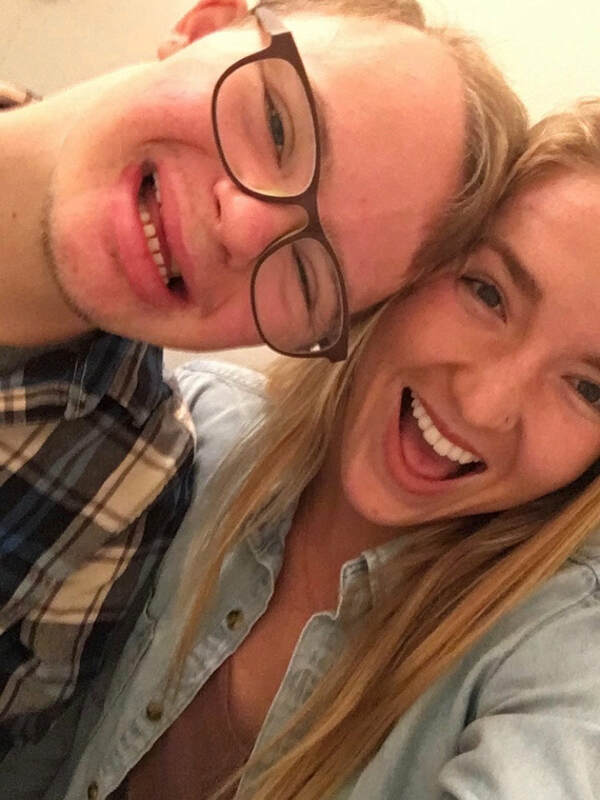 Through sharing Michael’s story, I aspire to not only give others a glimpse into living with a disabled sibling but to also disband the negative connotation surrounding the disabled community. I look forward to inspiring others to live not only their best lives, but to learn, grow, and approach life with the same sense of love and joy that people like my own brother do. And not to forget how thankful we are to all of you who follow and share our blog! So grateful for the endless support from friends, and for being part of an especially supportive swim team. 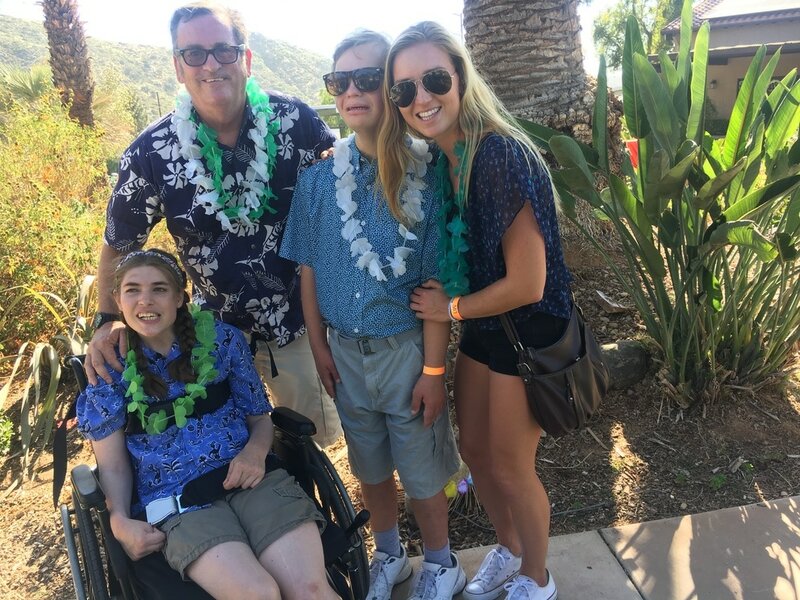 This past year we have met so many incredible families who have the same mission as us-- to raise awareness and enlighten the image surrounding the special needs community. Go ahead and check some of them out in the Other Stories and Other Sites section of our blog :) I cannot express how grateful I am to be surrounded with so many inspirational souls. I hope everyone had a great 3-day weekend! I ended up taking Michael all for myself on Saturday, and we had a blast! In San Diego it was scorching hot on Saturday, so what better thing to do than go for a swim? Since Michael's so skinny and sensitive to cold, it's been a while since I've taken him for a swim. But he loved it! 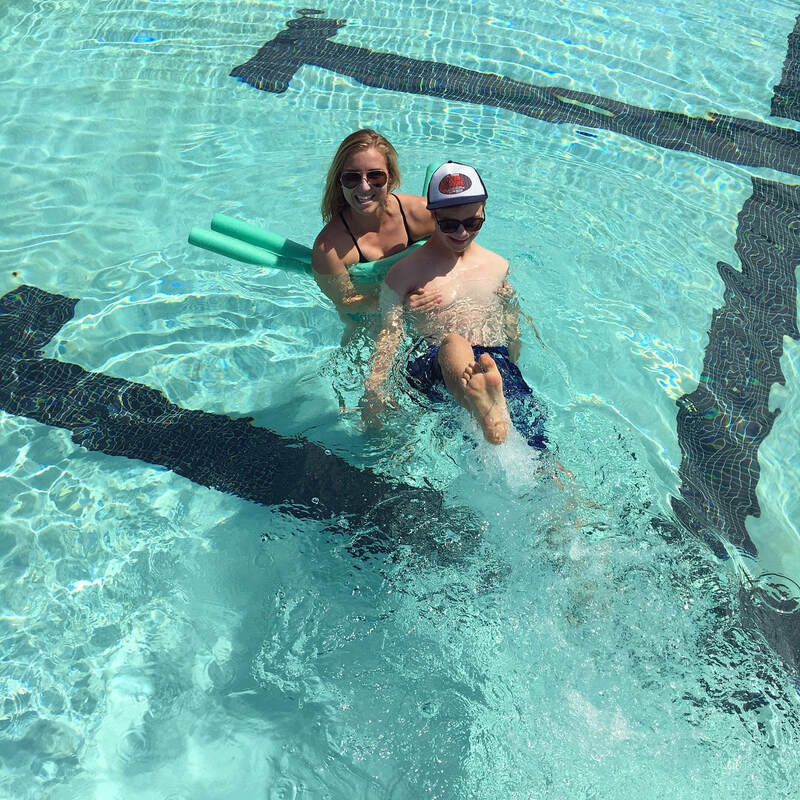 Since UCSD's pool was empty for a couple hours during a water polo tournament, it was the perfect opportunity to take Michael for a swim with no one else getting in the way. Michael doesn't know how to swim, but loves splashing around the water anyways! I would take two pool noodles and put them under his armpits while he floats on his back so he could kick around. The two noodles are good enough at supporting him where he can float and kick around as much as he likes! Michael can turn around on his own, but refuses to try and swim on his stomach. Every time I try to flip him over he would try and flip around onto his back. He especially liked walking around our hot tub (UCSD's got the best hot tub in the world if you ask me). Afterwards, we rinsed off and watched part of one of the polo games. 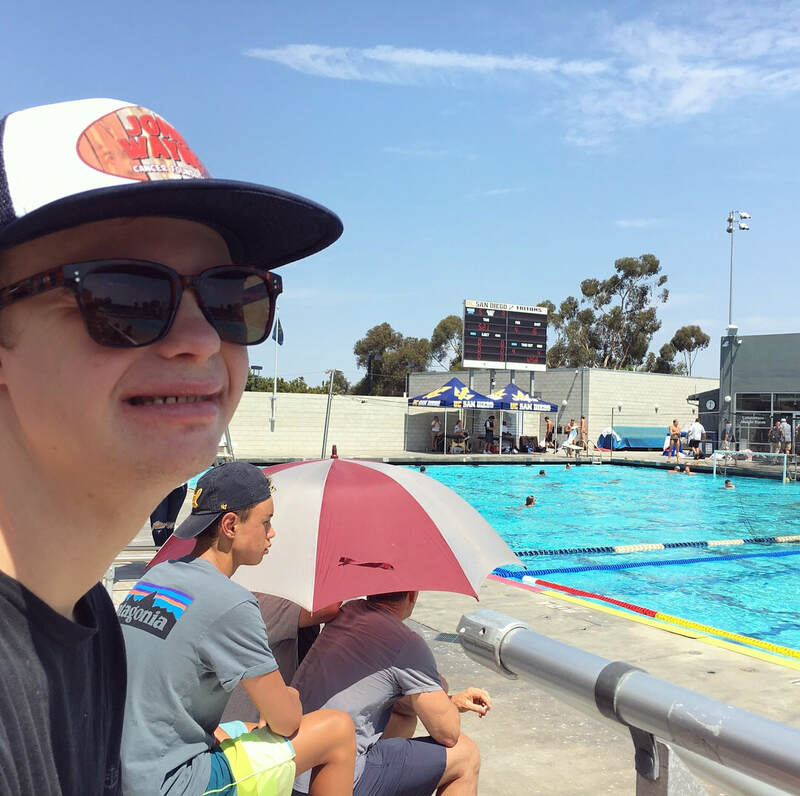 Michael's never watched water polo before but he loved it! It was a totally new environment for him, and he handled it really well. Afterwards, we made some lunch at home and watched some Game of Thrones. Michael loves watching tv shows or movies with action, so he really enjoyed watching GOT. A couple hours later we went on a Costco adventure, and Michael did really well with how chaotic it was. He really hates crowds and noisy areas, but only got upset once! Once we got the stuff we needed, we got dinner at our favorite restaurant, World Curry, and Michael was so happy and full of food. For this week's post, I wanted to talk about how we can travel with Michael. He absolutely loves going on adventures and visiting new places, but the traveling part comes with some challenges. In particular, the hardest thing is taking Michael to the bathroom. Michael used to only be able to go to the bathroom at home and at school, and would hardly ever go anyplace else. This made it really hard when we would travel to Yosemite as kids, since Michael would sometimes manage holding it for 8 hours until we got to the campground. Even after waiting at multiple rest areas, Michael wouldn't go to the bathroom. Recently he's been doing much better about going to the bathroom outside of his comfort areas, but he's never been on an airplane. Sitting on a plane for hours is miserable enough for us already, but it would be especially difficult for Michael. I honestly have no idea how he would handle sitting in the small seats, or if he would even want to walk into the plane in the first place. There are times where Michael doesn't even want to walk into a new friends house, and we'll have to calm him down for a few minutes until he'll actually want to walk in. There's no telling how he would behave while trying to board a plane with a bunch of passengers. Since he also hates the sound of kids screaming, if a baby was on the flight he'd also have a rough time dealing with that. Michael sometimes doesn't like wearing headphones, so it wouldn't be the most effective option against screaming kids. It's been a great couple weeks of summer, and so happy to finally get to enjoy some more time with Michael! Michael's finally finishing up with summer school, so that means: more beach trips! For this week's post, I wanted to write about how Michael is with food. Like the rest of us, he absolutely loves it! He may not be able to tell us what he likes through words, but he definitely shows it! Whenever Michael eats something he likes, he'll scarf it down faster than you've ever seen anyone eat. If he really loves his food he'll be smiling and giggling the entire time he's eating. As for his favorites, its really hard to narrow it down-- Michael loves almost everything! Haha when we were little and ate something I didn't like (I was the really picky eater between the two of us) I would throw my food onto his plate when my parents weren't looking. As for foods that Michael doesn't like, he'll still eat them. If he ever doesn't like something or doesn't feel like eating, he'll take forever to eat it, but he will always finish! With regards to what he can eat, we need to be really careful with what's on his plate. Until Michael was about 8 years old, he didn't know how to chew. So, most of his food had to be blended so that he wouldn't choke on it. Thus, soups and mashed potatoes were always great, but sometime's he would get his meat and vegetables blended in with them. Even now, we have to cut his food up into smaller pieces so that it's a little easier for him to chew them. 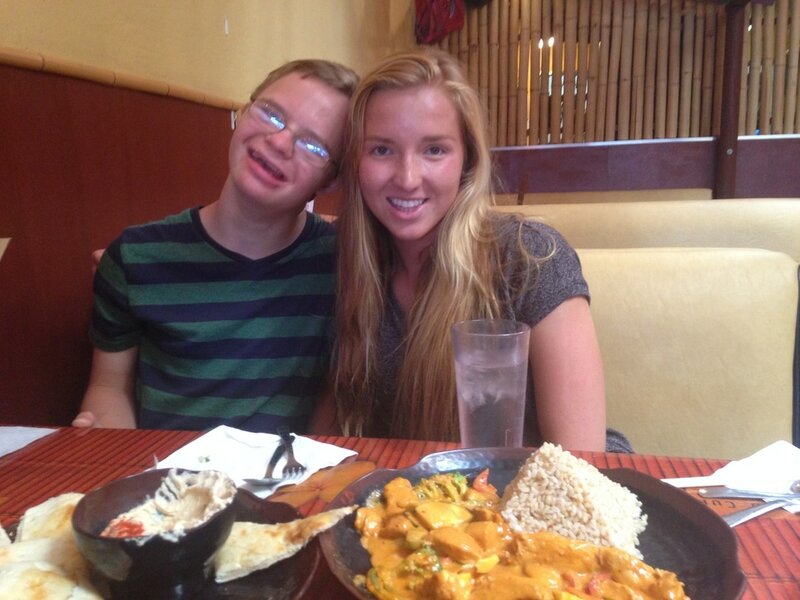 The only restaurant we've ever taken Michael to is World Curry, an amazing Indian restaurant in Pacific Beach. It's very low-key and not too crazy, so a great environment for Michael. And he loves his curry! I'll always end up cutting his veggies into smaller pieces, but he finishes his food so fast and loves it there. We have to be very picky with where we take him to eat, since he's got a sensitive stomach, and definitely cannot eat fast food. Lot of people with Down Syndrome have issues with constipation, so we need to be very careful with what we feed Michael, and need to track his bowel movements. 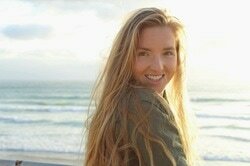 I'm finally finished with my 3rd year at UCSD, and am so excited to be able to work more with Michael over the summer! 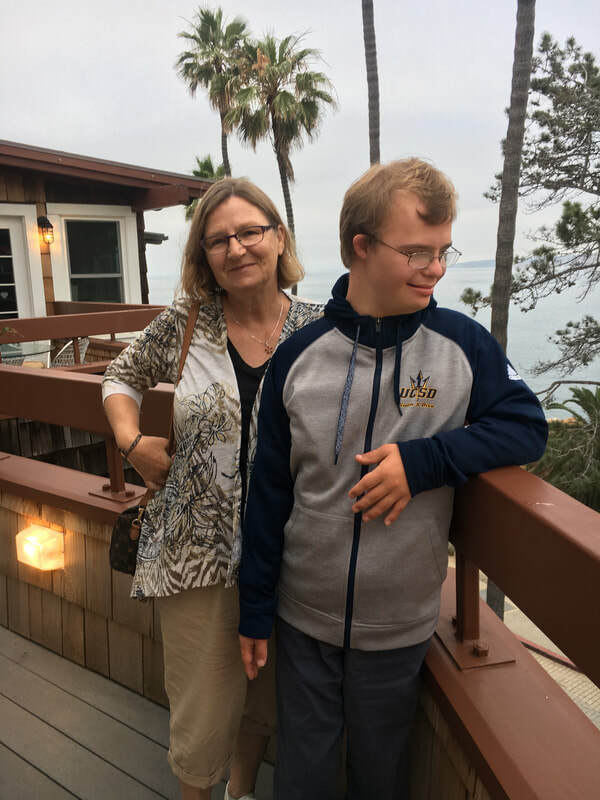 Michael will be doing summer classes for an extra 3 weeks to keep him busy, but he's been having a great time surrounded with a great staff and classmates. 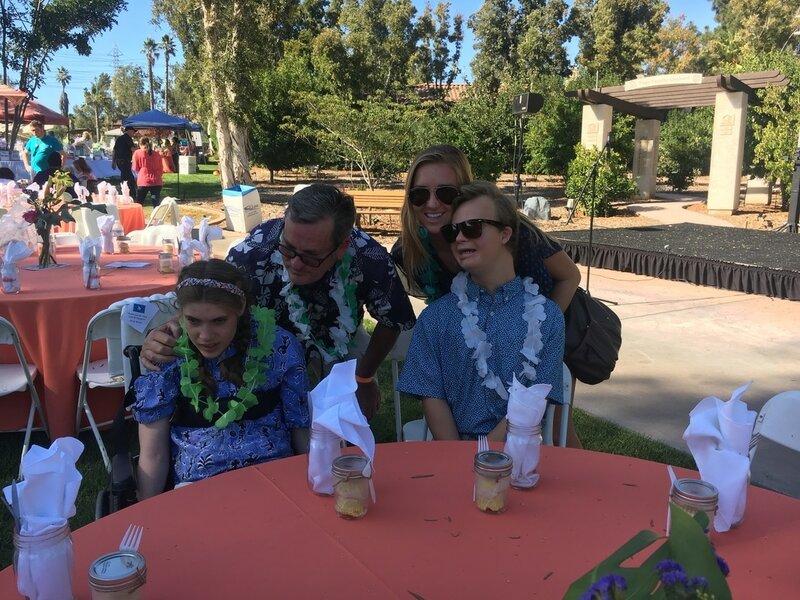 Noah Home's is an incredible organization over in East County, which focuses on giving adults with developmental disabilities a chance to live in a welcoming and loving environment. Dave gave us a little tour around the area, and I was amazed! All of the "houses" were so clean and beautiful inside, and what really surprised me the most was how it really felt like a home. The staff was so friendly and caring, and all of the residents got along together really well. The homes have grown so much, and in the past November, they just opened up one of the first Memory Care homes in the nation. The new Memory Care home provides a 1:2 staff to resident ratio, and incredible technology. Honestly, people like Michael love to be acknowledged! 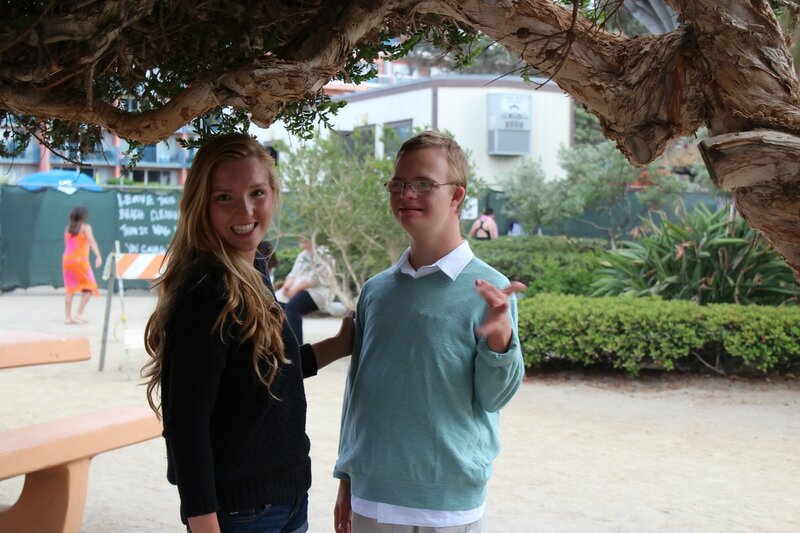 Even though Michael's nonverbal, he loves it when others approach him and say hello. He might not speak back, but he will wave back and acknowledge you. I know some people get really intimidated and aren't sure what to do, but Michael definitely notices if you ignore him. Others like Michael can tell if you're uneasy and uncomfortable, and there's honestly no reason to be! Even if you don't get a response that you accept, it's always really touching to see any form of effort put in. Overall, I'm forever grateful for being blessed with Michael in my life. He's always been incredible to have as a sibling, and growing up it's been obvious that we've got a strong bond. Michael does an incredible job of teaching not just myself, but others about how important it is to just enjoy life. Nowadays, so many of us stress out over things that don't even matter, and Michael reminds us to find joy in the simple things in life that are all around us.